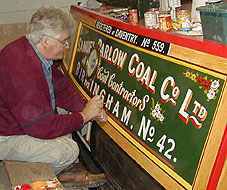 This included painting the cabin sides which was done by Ron Hough who probably did not do the original paint work (since he was doing his National Service at the time) but had done much similar work for Barlows. 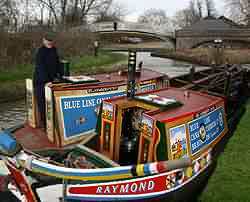 People who remembered seeing Raymond prior to her leaving Braunston in 1993 commented that the cratch was far too high. It was, in fact, correct for 1958 but had been subsequently lowered and it was decided to lower he new cratch to make Raymond look like the boat they remembered. 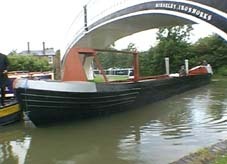 During the 1960s it had been necessary to lower the cratch because as the canals silted up it was no longer possible to carry a full load. 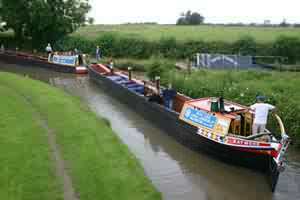 With the smaller loads the boat was higher in the water and so the original cratch would not go under the bridges. 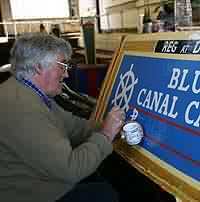 By this time the Samuel Barlow Company had been taken over by Blue Line and Raymond would have been repainted in their livery. So the rebuilt Raymond had been a bit of a mixture – the lower cratch, associated with Blue Line, but in the Barlow colours! … with the usual stunning results. … side by side and matching.